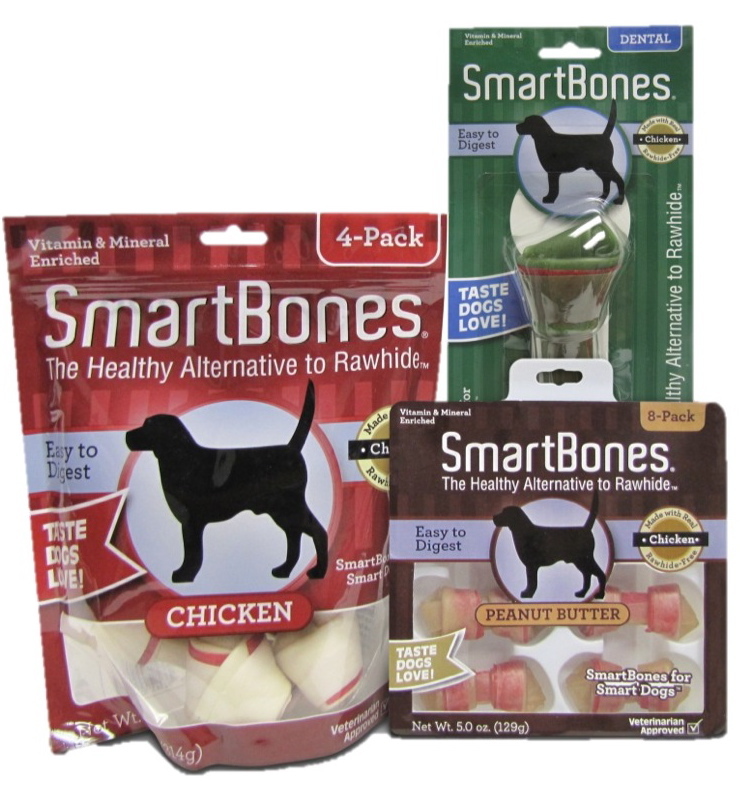 To Dog With Love: SmartBones Chew Treat Giveaway! Cosmo is a dog who likes a good chew, so when he got the chance to try out a new SmartBones chew treat he jumped right on it. And now you and your pups have the chance to win some too. Just read down to the bottom of this post to find out how to enter our SmartBones giveaway! These aren't your ordinary chews. 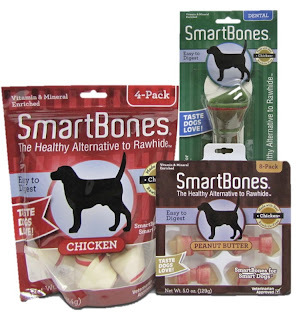 SmartBones are rawhide-free and are the first treats of their kind to be enhanced with vitamins and minerals. SmartBones are available in Peanut Butter and Chicken Flavors. There is also a Dental variety with additional teeth health benefits. We were sent a SmartBone in Peanut Butter flavor to try out and Cosmo was anxious to take it on a test run! So anxious, that he could hardly wait to get it out of the wrapper! Cosmo devoured his SmartBone, working on it steadily for about 40 minutes. That's what I call a good long-lasting chew! Cosmo's rating? Four paws up... he's ready for more SmartBones today! SmartBones are available nationwide and at www.smartbones.com. Two U.S. winners will win four SmartBones each in the appropriate size. The small was perfect for Cosmo! Entries must be posted by 11:59 p.m. ET on Wednesday, November 2. The SmartBones for this giveaway are being provided by PetMatrix. Leave a comment on this blog post telling us the smartest thing about your pup! Be sure to leave email contact info if your comment doesn't link to some contact information. Our dog knows exactly how to get our attention... and she always gets it when she wants it! Our boxer Dakota can turn on the dvd player with her nose she is such a smarty. My 6 month old mini doxie, Frida, knows that good stuff always comes out of the microwave, so when she hears it being turned on she runs and sits in front of it waiting for the beep. It's soo cute! My dog, Jack, used to hate baths but he still learned to cooperatively get in(it's hard to force an unwilling 90 lb dog into a bath tub) and turn around. Now he loves his baths, I think he learned they help his itchies(allergies) feel better. He actually lets me know when he wants to take a bath by leading me to the bathroom and stepping into the tub! Thanks for the giveaway. I joined the site on GFC. I followed Cosmo Havanese on Twitter. I followed To Dog With Love on Twitter. The smartest thing about my dog Bella is probably her ability to get into a jar of peanuts that was sealed with a lid. I dunno how but she did it. I follow To dog with love on FB. I follow cosmo Havanese on FB. Following cosmo Havanese on twitter. Bella has learned how to open the front door and let herself out. Now we have to make sure it is locked at all times! 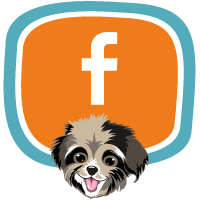 Liked Cosmo Havanese on facebook! The smartest thing about my pup is that he passed his canine good citizen test.